BOOK REVIEW by Bob Ricketts. Published by Bedfordshire Historical Record Society/ The Boydell Press. (Volume 94 in the series) in 2015. ISBN 978-0-85155-080-0. The Bedford Amateur Musical Society was founded in 1867. Now the Bedford Choral Society, it is still thriving. Michael Benson tells the story of the Society, from its inception and founders, its struggle to survive during the inter-war years, the impact of the arrival of the BBC Syphony Orchestra in 1941, and post-war resurgence. The account starts with an excellent introduction by Donald Burrows, Professor of Music at the Open University, setting the context for the Society’s formation, showing how by the mid-nineteenth century musical activity had spread down the social spectrum as populations and incomes increased. The first chapter describes the development of choral music in Bedford from c.1800 to 1866, starting with the public performance of Handel’s Messiah in 1812, given with the assistance of some musicians from London. There followed a music festival in 1825, held in St. Paul’s Church. A further concert was held in the newly-built Bedford New Rooms (Assembly Rooms) in July 1836. The Bedford Harmonic Society was founded in January 1837, which aimed to put on six concerts a year, remaining active into the 1860s. A Church Music Society was established in 1865, surviving for a number of years. Chaper Two describes briefly the formation of the Bedford Amateur Musical Society, highlighting the important role played by its three ‘founding fathers’ – Philip Henry Diemer, Robert Rose and Hermann Steinmetz. Chapter Three, entitled ‘Eminent Victorians’, describes the Society’s growth and the impetus provided by the opening in 1874 of a new concert venue – the Corn Exchange. Chapter Four – ‘Ere Armageddon Came’ and after’ – deals with the period 1900 to 1923, though the Society was effectively dormant during the First World War. Chapter Five – ‘Decline and Fall’ – documents the struggle to survive during the 1920s and early 1930s, culminating in the closure of the Choral Society in 1933, attributed in the local press to a “lack of enthusiasm” amongst its members. Chapter Six – ‘Entr’acte, 1933-41’ – records the activities of the remaining other choirs in Bedford – the Mary Palmer Choir, The Polychordia, the Bedford Orpheus Choir and the Bedford Messiah Choir – and the Bedford Music Clubs. Chapter Seven describes Marshall Palmer’s successful reform of the Musical Society from 1941. Chapter Eight – ‘Great Expectations, 1943-47’ – is likely to be of more general interest, dealing with the arrival of the BBC Syphony Orchestra. Chapters Nine and Ten chart the Choral Society’s post-war development to 1991. This is followed by an ‘Afterword’ covering the years from 1991 to 2015. Detailed appendices follow, listing the concerts and works performed from 1867 to 2010; choral works performed 1920-33 by the Bedford Free Church Choral Union/Choral Society; orchestral works performed 1924-29 by the Bedford Musical Society. An extensive bibliography is provided, and the volume is well-indexed and illustrated with 16 colour and black and white plates. 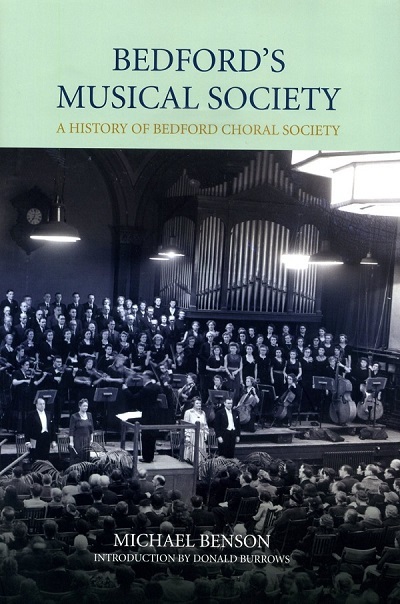 ‘BEDFORD’S MUSICAL SOCIETY A history of Bedford Choral Society’ is a well-written and researched, comprehensive account of the development of Bedford’s enduring musical tradition, adding to BHRS’s stable of high quality publications. It will certainly be of considerable interest to local musicians and those who have been involved in the Society, but unfortunately is likely to have a more limited general appeal due to its narrow subject matter. Nevertheless, the impressive research shown represents considerable achievement on which Michael Benson is to be congratulated.